At the afternoon performance on Sunday 10 February 2019 there were quite a few adults in the Teatro Nazionale, a smaller venue of the Teatro dell'Opera di Roma. The auditorium was packed with children aged from six to fifteen. 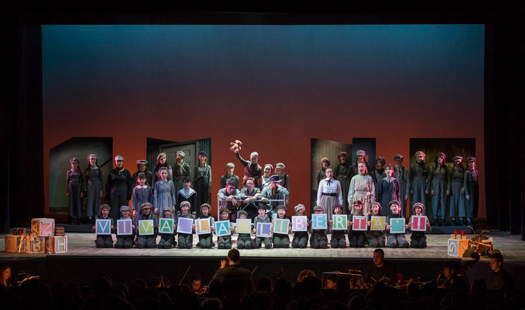 The performance was Il Piccolo Spazzacammino, which is the Italian version of Benjamin Britten's The Little Sweep in a Reate Festival production. This is a small but high quality music festival in Rieti, a provincial town north of Rome. 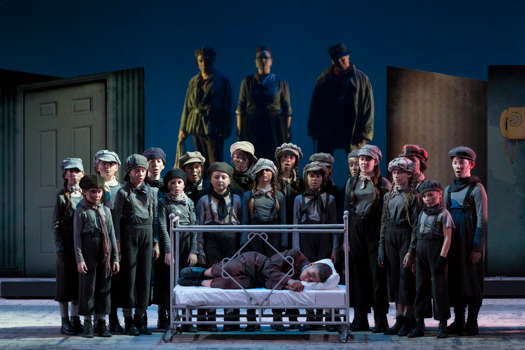 The production had its debut four years ago and was so successful that it became part of the Teatro dell'Opera repertory in a special section for children. An interesting feature is that the singers and the small chamber orchestra are youths under training at Fabbrica, Teatro dell'Opera's finishing school for singers and instrumentalists. As readers will know, The Little Sweep is the second part of a stage production entitled Let's Make an Opera! The first part takes the form of a play in which the cast portray contemporary amateur performers conceiving, creating and rehearsing the opera. Intended as an introduction to and de-mystification of the operatic genre, the play also provides an opportunity to rehearse the audience in the four Audience Songs they will sing after the interval. The format of the play altered radically in the early months of its existence, passing through at least three versions, including one specially written for radio, using different approaches. In this Italian version, the setting is not a farmhouse in the nineteenth century but an upper middle class mansion sometime in the first part of the twentieth century. The plot does not change. Black Bob (Timofei Baranov) and Clem (Jaime Canto Navarro) purchased little Sam (Lorenzo Gambenedetti) from his starving parents and order him to clean the chimney in the residence of Mrs Baggot (Irida Dragotti). The boy is stuck in the chimney and shouts for help. 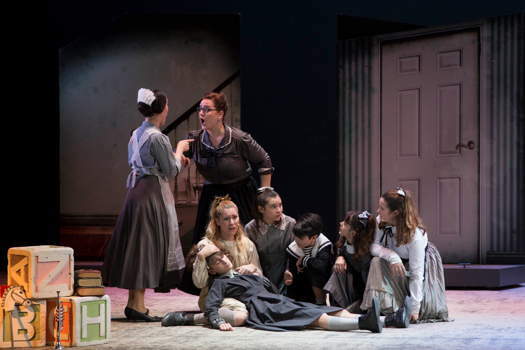 The children in the home, Giulia Peverelli, Angelica Splesser, Isabella Mastroemi, Anastasia Spolvieri and Carola Finotti, as well as the maid, Louise Kong, help him to get out of the chimney, bath him, give him new clothes and find a way for him to escape toward a better future, whilst the grown-ups are messing about. The plot is one single act with quick changes of scenes and sets. The singing is in Italian and there are no Audience Songs. In spite of these adjustments for an Italian audience, the little opera keeps its fresh flair of an anthem to innocence, a central point in Britten's work. Maria Rossi Franchi's stage set and the costumes by Anna Biagiotti and Simona Scandagli are simple and effective; they can easily travel from theatre to theatre and from town to town, as intended. Cesare Scarton's excellent stage direction is very fluid. He must be congratulated because it is not easy to work with very young singers-actors. Carlo Donadio conducts a small chamber ensemble of the Youth Orchestra of Teatro dell'Opera: all quite good, especially Lochlan James Brown and Elena Burova, playing piano four hands. The young were enthusiastic. Many of them were listening to and seeing an opera for the first time. I trust they will come back to other operas as they grow up.